Remember those delicious Barcelona Brownies I posted about recently? Well, they came from the Rose’s Heavenly Cakes cookbook by Rose Levy Beranbaum, and the kind people at SpruceTV.com gave me an extra copy to give away to one of my readers. The book is filled with gorgeous photos and delicious recipes, and is one you want to have in your collection, trust me. To enter, leave a comment below telling me something (anything you want!) about yourself. And if you’ve made anything from my blog, tell me about it! Contest ends at 11:59 p.m. EST on Thursday, February 4, 2010. One winner will be selected at random on Friday, February 5, 2010 and contacted by email shortly thereafter. Please note this contest is only open to residents of the U.S. and Canada. My name is Katie, I’m freezing my tail off in MI. I am an unemployed archivist. (I bet you hear that a lot) Today is my 4 year wedding anniversary and I’ve printed off the recipe for crackles 3 times only to have each one disappear. I’m pretty sure my 20 month old is waiting for them at the printer and throwing them away:) Guess I should check the trash! I have made many things from your blog, but I am very interested in the toothachey penuche. However, I have to go test a tres leches cake, so penuche is for another day. I have always heard good things about RLB books but do not own one, so this would be very exciting. Plus, if I win, you could hand-deliver it, and we could have lunch. Or we could just have lunch anyway. About me: I turn 38 next week. And I really did think someone had stolen my umbrellas this morning. And I went and bought myself a pretty new umbrella anyway to replace my 17-year old one. Hi! I am a mom of three and have been reading your blog for, what seems like, forever. I think it was the first baking blog I found! I have made your Strawberry Buttermilk Cake and it was yum! I am trying to take the New Year’s weight off so your website isn’t helping! Keep up the great baking! I should really stop making desserts but I can’t. It’s the only way for me to calm myself after a long day at work. That and to eat a ton of sugar. My name is Kylee. I am a SAHM of three kids. I love cooking, baking, and crafts. You have a great blog! Count me in on the cookbook giveaway!! I have to tell you THANK YOU for the penuche recipe!! I made it, it was scrumptious! I plan to make it for Christmas next year! I have 3 sons so I don’t get to cook and bake nearly as much as I would like to – mostly because I can’t leave them alone for a second. Today I caught my three year old feeding my 9 month old toothpaste – a cake from this cookbook would be so much better! Oh wow I’d LOVE to have this book! I was such a fool at Christmas time, I found this book for 30% off at a bookstore that was closing. I didn’t buy it!! I dunno why, but I thought someone was going to get it for me for Christmas! I am new to your blog and I’m so excited to begin baking some of your recipes. The first one I plan on making is a brownie recipe you had up a week or so ago. I am an artist (I teach it and have a woman’t clothing line), baking has been another outlet for me. Baking brings me peice and helps evolve my creative process. I have a small set of cookbooks that I’ve been collecting over the years…and, finally, in the last two years I have been trying out difference recipes. The cookbook I use the most is my Settlement Cookbook. I’m currently entertaining some of my students while they wait for their parents. I love teaching…I teach art to the lowest 3% in their district. I teach art as an intervention to help assist the students towards academic success. Happy Birthday to Jami and Happy Anniversary to Katie! hi! my name is jersey and i live in colorado. i recently discovered the art of baking (like a year ago) and have totally become hooked. this is a great giveaway!!! i have made one of your fabulous brownie recipes (i dont remember which one off the top of my head. i think it had peanut butter in them?) anywho… i LOVE your cite so keep the awesome posts coming! my next attempt is your peppermint patty recipe! At the moment I am I only bookmarking recipes from your blog. The most recent one I saved was the salted caramel frosting. I am in the process of remodeling my kitchen,. Since I haven’t seen “construction dust” listed as an ingredient in any of your recipes, I have to wait to bake. I am a chemist. Actually, chemistry is very similar to baking; just don’t lick the spoon (I’m sure that’s on a bumper sticker somewhere). heh I am a So Cal native and I hate coconut also. How’s that for random stuff? I love your blog and have made many, many things: brown sugar cookies, chocolate chip cupcake/muffins, hershey’s white chip brownies, some type of chocolate chip cookie, vanilla cupcakes, sables, world peace cookies, buttercream frosting, gooey chocolate cake and cookies & cream fudge come to mind right now. So, yeah, thanks for all the great recipes!! My name is PJ and I am from South Carolina. There are no children at my house, only 4 yorkies and 2 rescue cats. My house is very lively. I love cooking and I love your website. The low-fat banana muffins are super-fantastic!!! I took a batch to my cousin’s one Saturday afternoon and her grandkids had them eaten up before she could even try them. Auntie M loves them, too. There are a couple more recipes on my list to bake next….like the chocolate crackles! The recipe selections are quite unique, I think. Keep them coming. Thank you for sharing! Hi, my name is Cairine. I love to bake even though I don’t have a “sweet tooth”. My aunt started to teach me to bake when I was about seven. I just discovered your site today so haven’t had time to bake anything from it. Hi! The weather today in Austin, Texas was beautiful. The sky was blue and the air was cool and walking all over campus while listening to Billy Idol was fun. I’m doing homework right now, but I decided to take a break and catch up on a few blogs. But now, back to homework! i’m an avid reader and have made the shortbread quite a while ago. i am now eager to make the penuche. hmmmn, something about me? i’m celebrating my two year anniversary in early march and i love small dogs in clothes, lol. I love to bake – anything and everything. I orginally found your blog years ago when I googled magnolia’s buttercream. I have since made that many times. I just looked at this book at the bookstore and immediately added it to my wish list! I shouldn’t enter as I need to lose weight but whatever, I love to bake! AWW, pity! I’m not residing in the US. iI’ve been itching to get this book! well congrats to the lucky person huh! My name is Kim. I’m the single mother of 3 of the greatest kids on the planet. My oldest is 16, the middle is 14 and my baby is 2. I LOVE to bake. I’m always looking for new recipes to try out on my kids and they love it. Hi! It’s Laurey…enter me into the running for the book as well. Anyways, fingers crossed that I win this, and get to try out some new tasty treats! Hi! I’m a stay-at-home-aunt, I take care of my 3 yr old niece and my 6 yr old niece when she’s not in school. (Crazy times!) I love to cook and bake; I started when I was four. I would love to have this book to add to my extensive collection. 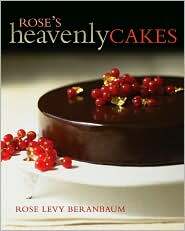 Rose Levy Beranbaum’s The Cake Bible is a classic favorite of mine. I love how she presents, not just the how’s of baking, but why you should do a certain way. I’m a medical student, knitter, whitewater kayaker, daughter, sister, friend, runner, kitchen adventurer, and avid library visitor (book lover living on student loans!). And I really wish that I could describe myself that way on job interviews! I really enjoy your blog, and will definitely be using your suggestions for one of my upcoming kitchen adventures-marshmallows. I also plan to have an adventure with my Artisan mixer and pasta dough…but that’ll be a whole other project! That book has been on my Amazon wish list since it came out! It’s so beautiful, I look at it every time I go to the book store. I even made a cake from it, Rose’s Whipped Cream Cake, the recipe is available online. It’s not the most beautiful cake but it’s really simple and elegant- and of course good! Thanks for the giveaway!! Very cool! Hmmm… something about me… Well, all I can think about right now is going to New Orleans next weekend for my 30th birthday! Woo hoo I can’t wait! Hi, I’m Martha. I’m 26, I just graduated from law school, and I’m a judicial law clerk. I’ve spent the last three years mostly eating my husband’s version of food and the last 10 months teaching myself to cook again. And I’m making your chocolate salted carmel cupcakes tonight! While I do not have children of my own I usually have a child with me. (I have 6 younger siblings and due to them I am an aunt over 10 times). I do not have a paying gig but I certainly keep busy. I have a health issue (DVT). I have been married for over 11 yrs. Hi, my name is Carla. I am a SAHM to two children, girl and boy. I have been following your blog for what seems forever. I absolutely love baking, probably more than cooking. Baked goods like me back, a little too much, so much that they stay with me permanently, lol. So, I try to restrain myself. Thankfully, I have a husband and two children that love sweets as well. I have not tried any of your recipes, yet. But have plenty bookmarked. I would love to win this book, thanks for hosting this giveaway! I feel pathetic. I’ve been reading your blog for about a year now and I don’t think I’ve made a single thing. I’ve used some of the ideas to make other things, but never a straight shot. It makes me feel weird, because I love reading your posts! I recently got a rescue dog. His name is Victor and I’m currently home getting him acclimated to life with a cat. It’s a good time had by all, except for maybe the cat. Im Elle, I really want to go to culinary school because my favorite thing in the world is cooking it makes me super happy when my friends love my cooking. Ive made the red velvet cupcakes fr my friends birthday and she loved them they were delish. I love to bake and am in the process of teaching my daughter to bake too!! She has gotten some very good results already. Thanks for the chance to win a new baking book!! I just got a brand new stand mixer for Christmas, and it is begging me to use it to make your Barcelona Brownies! I’ve really been enjoying your blog. Always find something yummy to consider! I’d love to win, I love baking, and passed my passion for it down to my daughters. I love to cook, although these days being 7 months preggo & working fulltime, I don’t have much time to. I am married to chef, but I LOVE to do the cooking and the baking! I haven’t made anything from here YET… but that’s only because I just discovered your blog. It’s awesome BTW!! Looking forward to trying some of the recipes :o) Definitely excited about the possibility of winning the cookbook too! Hi! Your blog is one of my favorites! I enjoy cooking and baking all sorts of things. I am determined to add much more to my own blog in the coming year. I have made many things of your site. One of my favorites is your recipe for peanut butter cup cookies. Those are a family staple at Christmas and anytime we want a yummy treat! I’m going to quietly admit that my Kitchenaid Mixer kind of intimidates me. But I’m going to check out your recipes and see if I can triumph over the big red machine! I love to cook and I’m REALLY good, I swear! But when I try to bake I almost always fail and 60% of the time come close to burning the house down, it’s pretty sad! I am going to try to make those brownies for Valentine’s Day though. I think my husband would love ’em. I’ll have a backup just add oil box ready with hotel reservations just in case!! I am going to make your recipe for the oatmeal cream pies. Yum! Thanks for the recipe. Just discovering your blog and I too LOVE my Kitchenaid mixer! Already have found multiple recipes on your site that I am dying to try! I’m a cat mom of a new feline fur child named Katie who appears to be one of the few cats who is indifferent to catnip. I love baking but took some time off for a few years from really indulging it when life got in the way. I love reading cookbooks, am always returning library books late and miss Haagen Daaz’s Sticky Pudding Ice Cream flavor. This is a totally awesome giveaway. I love to bake! I am 34 and I live in Wisconsin. I am actually a baker by trade. I make a lot of morning pastries at work. It’s a tough job and I work the graveyard shift, which makes me tired all the time : ) That being said- without fail, every day off, I pull out the old mixer and whip up something. It’s somewhat of an addiction. I really like your blog and I would love to have this cookbook! I don’t think I’ve made anything from your blog yet. But that cookbook sounds amazing. I love to bake even though my tummy probably doesn’t need any additional inches added to it. I’m starting to collect cake stands, and this cookbook looks like it has the perfect cakes for displaying! I am a hockey mom from NH. I have been driving since 6:30 this morning. I’m tired. I am new to your website, but am certainly enjoying it. Haven’t made anything yet, but will most definitely in the near future. My three passions are photography, travel and baking ;). Reading food blogs has made me much more daring about what I eat and cook. I’ve made your brown sugar cookies (YUM!) and sugar cookies with powdered sugar glaze. Thanks for having the giveaway! Love to bake and in awe of your blog! Hi. I’m laura. I live in VA with my husband and little boy. I am a former therapist turned business owner. I’ve made the bagels on this site with nice results. Baking is my favorite cooking – my best self therapy. I figure my day has been rough so Ill throw my name in the hat. I love to cook and am a timid baker… I have a million recipes for cooking, and I m trying to spread my wings in the baking dept. I have no baking cookbooks in my library. something about me. If I didnt have to worry about money I would go back to cooking school. I’m Heather, mom of 2 and devoted armchair cook who doesn’t try all the glorious new recipes she reads nearly as often as she should. I love Rose Levy Beranbaum. If were a zombie who was into food, I would eat her brain. Realistically though I’d probably be killed by a shovel to the head long before I found her. Can’t wait to try your penuche! I LOVE to bake but just don’t have the time I need to do it! Love anything chocolate. This is an exciting giveaway. I am a teacher who loves teaching and loves my class, each and every one of them. i’m a scientist by trade, but a baker at heart! I am a baker tried and true. Nothing brings me greater joy than to get compliments on my baking. I love your cobblestone brownies, these are my go to brownies for homewarmings, pot lucks, birthdays, ect. They are not only delicious but beautiful too. Thanks for the recipe! I enjoy checking out your blog and dreaming about the day I can actually make some of these things 🙂 My life is a bit to crazy with twin boys, working full time, yada yada….but a girl can dream. I am an old pal of your sister’s and your dad was my eye doctor as a kid! I am currently a laid off teacher so I have been into blogging, cooking, and sewing…as I try to forge a new career path. I was super excited when your sister told me about your blog and I have showed it to a bunch of my friends. Nice work!! Hi! I’m a mom, ICU nurse and foodie! Love your blog and thanks for the chance to win something! Hi! I just found your blog yesterday, so I haven’t made anything yet from it, but I’m really excited to (reading it made me very, very hungry)! I’m a chocoholic, and love to bake!! I’m a stay at home mom with two wonderful kids. Hi, I’m Renee from Washington. I love cookbooks and I love to cook and bake. I love to do crossstitch, read, sing and spend time with my husband and two boys. Having lost a significant amount of weight about 9 years ago and “finding” some of them again, I have found that there is a balance between eating the things I love and moving my body to lose the calories. I love to bake and still endulge my passion by sharing the goodies with friends (so I can get them out of my house after a taste or two!). Those brownies looked amazing! Something about myself is that.. I literally live off desserts! I’m a super picky eater and I eat desserts for meals! i cant cook at all either, so i can only bake edibles. its the best lifestyle! I can’t cook to save my life, but I love, love, love to bake. My New Year’s resolution (sticking to it so far!) is to only bake one thing a week in an effort to keep my hips from expanding. Unfortunately, my first job out of college is at a cooking magazine, which means lots of trips to the test kitchens. I graduated from college with a degree in history (to teach) and then decided I want to become a nutritionist instead. Now I find myself drooling over dessert blogs instead:) I just found your blog and am ready to spend a potential winter warning tonight making a goodie of any kind. Something about me: I just got a new job, and I’m going to make my references your oatmeal cream pies! Yum! Made the brownies for my 1yr anniversary! they were delish! Love this site and love baking!! I am an American living in Israel, but would love to give this book to my Mom in Florida. Love your site- always get lots of great ideas and recipes! Hi, I just recently found your site when i was looking for some goodies to make. i found your recipe for whoopie pies. I have not made them yet, but plan to soon. I am trying to get somewhere with cake decorating and other goodies. I havent done to bad for only been doing it since last august, mostly bday cakes, but have 4 weddings lined up this yr so far. Your goodies that u made look real good. I love the world piece cookes and the chocolate crackles. Glad i found your site. I have made a few things from your site, but by far my families favorite was the mini hamburgers with Nilla Wafers! What fun! I usually cook more than I bake but I’m attempting to master cakes! This cookbook sounds like so much fun! Hi, I’m Lauren, I’m 20, and I love to cook and bake. I would love to win this so that I can grow my recipe list and experience. I LOVE to cook but struggle with baking. My wonderful husband who has a sweet tooth out of this world once told me after slaving in the kitchen over choc chip cookies that “they still don’t taste like my moms”. (can you believe he had the gall) Well I didn’t give up and continue to still try my hands at Pies, cookies, cakes and other wonderful sinful things. I was happy to have tried your choc chip cookie recipe that uses choc pudding because it seems to have satisfied my husband and his awful desire for his mothers choc chip cookies! (she live across the country therefore allowing him to only get them once every so often). Eating, cooking and photography is my passion – along with working out and theatre. 🙂 My partner is a chef and I was raised in Texas by a mother that wouldn’t quit in the kitchen. So when it comes to a culinary life, I suppose it was my destiny. I love a challenge and I love learning from everyone. Strangers, famous chefs, friends, family, myself, etc. Today I have two cornish hens in the slow cooker, mostly because I needed to get them out of the freezer before they were covered in ice. I should start a blog, but I spend too much of my time reading other food blogs! 🙂 One day. I am Maria and I loooove to bake! It’s such a release from a stressful day. It does help that my family will eat anything… I don’t have to worry about leftovers. Hi, I am a nursing student in Oklahoma. Your red velvet cupcakes are to die for! They won my future father in law over!!! !